This is a special one week only raid which is available from June 30, 2008 to July 6, 2008. You must have at least six and no more than 54 people in your raid. Denlin Merodon may be found at -53, -57, -156, just south of the Soulbinder in the Plane of Knowledge. You do not meet the player count requirement. You have 1 players. You must have at least 6 and no more than 54. You have entered Dominion of Despair. You have entered an Arena (PvP) area. This event takes place in The Arena. In the middle of the zone you will see a large bazu called "Avatar of Despair". Your goal is to kill it in the quickest time possible. These adds AE a variety of spells, from snares to several-slot dispells. The Avatar itself gains strength and melee abilities as it decreases in health. It also has multiple AE gravity fluxes. Rewards scale based on how other guilds/raids do on your server. The raid that kills it in the quickest time receives the best reward. In the outer Planes, a new menace stirs. 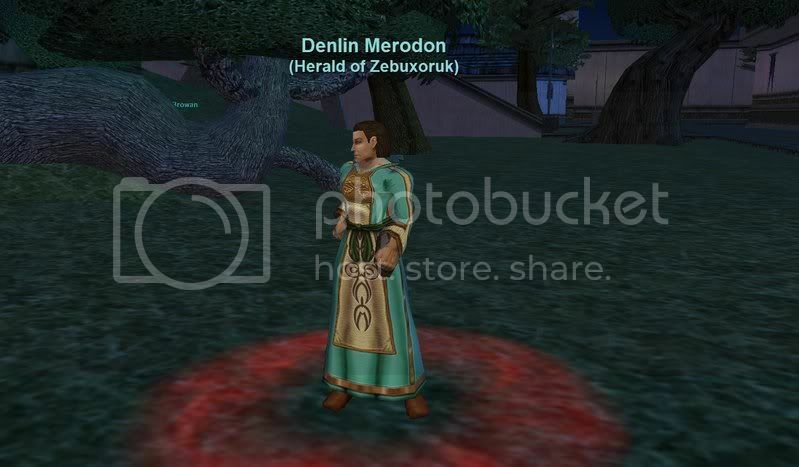 In the Plane of Knowledge, a Herald of Zebuxoruk is gathering groups of Norrath's mightiest heroes to challenge a foe that the Gods themselves cannot defeat. Do you dare answer the call of the Gods and face the Avatar of Despair? Rules: This raid tests the battle prowess of the raid force. Once the scenario is triggered, the Avatar of Despair will spawn. Players must work together to defeat this threat as quickly as possible. The more quickly the Avatar is defeated, the better the ranking for the participants. Rewards: Individual rewards for this raid event will be calculated based on the best attempt for each player. Every participant in a raid group on each server will receive an item from the initiating NPC that is used to track their progress. Once the results for all raids have been tabulated across all servers, a scaling item reward* will be given to players based on their relative performance in the raid. The first round of this raid scenario ends on 7/6, so get ready to have some fun! Check the leader boards table of guilds & players to track your progress and compete with your friends. *One per character, non-tradeable. Sony Online Entertainment, in its sole and absolute discretion, will determine raid performances and corresponding rewards. so, how fast do you have to kill him for the XL aug? Bummer they took it out. Resist for spells on this event are. Not 100% on melee but my limited info indicates. Maybe 2 handed weapon is last type not a melee so not sure on that. Melee switch timeing is the last peace of event info that really needs to be locked down. Killing a add does seem to stop its AE from firing. I beleave there every 5% after this point until ether 15% are 20% when they stop. then Boss starts FD Knockback Snare AE. I am looking for information, has this event changed in any way from previous years? Anyone have any advise? At 75% is when the adds begin spawning. There are 3 total. One of each type. They only a/e on depop. The avatar also begins powering up at this point. Adds spawn at each 5% from 75% down. Throughout the event, begining at 75 or 80 he will develop melee and spell resistances. These appear to be linked to his hp %. These are the emotes, the given dmg type is pretty much the only dmg type that can hurt him. Melee and spell are separate, so from 75% down, as a general rule you will only have 2 types of dmg available to you, 1 melee type and 1 spell type. Avatar of Despair 's rage seems to be building! At 25% you get the last set of adds. At this point he begins a/e rampaging and using his a/es. One is a knockback with FD, the other is a gflux. There is also something that will strip lev. It wasn't consistent, and it didn't appear part of any a/e. It also hit random people, not everyone in range. adds still spawn from 25% down. Last set of adds are at 15%. [Tue Jul 01 17:22:58 2008] You do not meet the player count requirement. You have 1 players. You must have at least 6 and no more than 54.